The compact footprint of HS-2410A makes itself adaptable to a wide range of counter styles and allows every inch of the work space usage to be optimized, thus creating maximum profit return for the store owners. This is what space saving is all about. 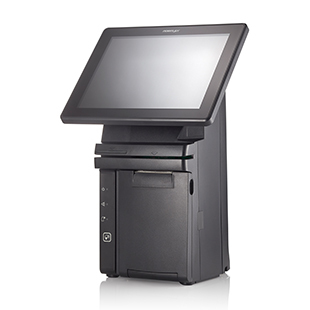 As an “All-in-one” solution, HS-2410A touch-screen terminal integrates some of the most widely used peripherals in daily POS operation, such as 2” auto cutter thermal printer, MSR, and customer display, and has the features and functionality to cater for applications in retail, hospitality, health care, banking and more, while offering uncompromising performance. HS-2410A is powered by Intel® N2807 Processor that offer vastly superior performance than most of the Android based POS terminals that used other processor brands. Dressed from head to toe in timeless black or white color, the only trend that never goes out of style, and with stylish touches added throughout, HS-2410A is not just a piece of machinery, it is an elegantly crafted piece of art that looks right at home in any store decoration.